If a backup file resides in a remote location (in a network shared folder or on a backup repository), you must select a network adapter or wireless network that you want to use to connect to this remote location. 1.In the bottom right corner, click the network settings icon. ▪If network connection settings are included in the Veeam Recovery Media, or if there is a DHCP server in your network, Veeam Endpoint Backup will configure the network settings automatically and display available network adapters in the list. ▪If you want to access the network shared folder or Veeam backup repository using a wireless network, select the necessary network in the list and click Next. If the wireless network is password protected, you will be prompted to specify a password for this network. ▪You can manually configure TPC/IP v4 settings for adapters if necessary. To do this, select an adapter in the list and click Properties. 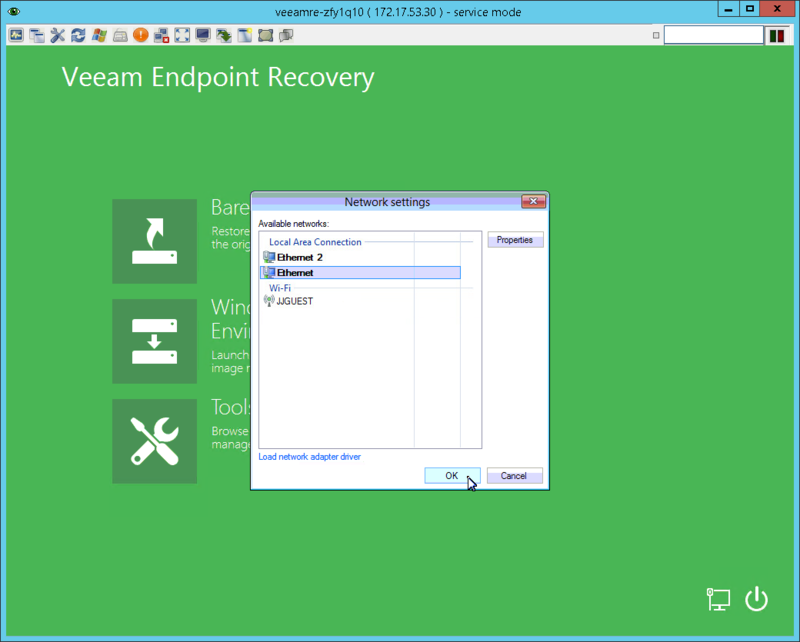 You will be prompted to configure network settings manually if Veeam Endpoint Backup does not detect available networks and there are no network settings included in the Veeam Recovery Media. 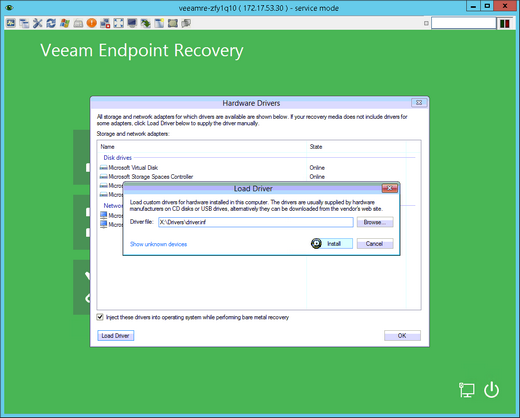 ▪The driver for the network adapter is included in the Veeam Recovery Media but failed to be installed automatically for some reason. ▪The driver for the network adapter is not included in the Veeam Recovery Media. 1.In the Network Settings window, click Load network adapter driver. 2.In the Hardware Drivers window, select the necessary device. If you want to add drivers for all listed devices to the restored operating system, select the Inject these drivers into operating system while performing bare metal recovery option. If you do not select this option, only standard Windows drivers will be added. 3.Click the Install link next to the selected device. 2.At the bottom of the Hardware Drivers window, click the Load Driver button and select the INF file in the driver package folder. You can also click the Show unknown devices link to see a list of all existing devices without drivers. This information may help you to identify the exact device for which you need to install the driver.